This was the second cake I baked for my eldest son’s birthday in August. The Texas White Sheet cake was the first one. I was not sure how the sheet cake would turn out and didn’t want to disappoint him with a sloppy cake. At the same time I also didn’t want to bake a cake which I already have in the blog. 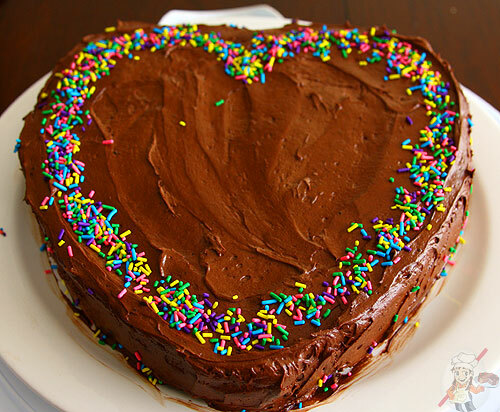 So while browsing for simple birthday cake recipes I stumbled upon this one. I decided to halve the recipe and bake it as a single cake instead of a layer cake because I already had the other one and was also planning to bake red velvet cupcakes if time permitted. I chose to bake it in heart shape pan. 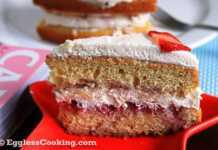 This recipe is quite similar to the strawberry cream cake recipe. I used buttermilk and silken tofu to replace the eggs used in the original recipe. The cake turned out really good. It was very fluffy. I didn’t soak the cake in simple sugar syrup like I did for the strawberry cream cake, so the cake did harden quite a bit in the refrigerator but softened once kept at room temperature for about 15 minutes. So make sure that you remove the cake from the fridge at least 15-20 minutes before serving. cake flour = 2 cups of all-purpose flour – 2 tablespoons of the flour + 2 tablespoons of cornstarch. Sift nicely. butter = vegan alternative like Earth Balance if you want to make it vegan. silken tofu = unsweetened applesauce (but cannot guarantee the amazing texture of using silken tofu). buttermilk = 1 cup non-dairy milk mixed with 1 teaspoon apple cider vinegar. Preheat oven at 350F/180C for 15 minutes. Line a 8/9-inch pan with parchment paper or lightly grease it with non-stick spray. Sift together the ingredients listed in Part 1 and set aside, in a medium bowl. In a large bowl, beat together the butter and sugar, until light and fluff. Add in the vanilla extract too. Add the pureed silken tofu and beat well. Now add in the buttermilk and beat in low speed. The mixture does look curdled, but nothing to worry about. Add the flour in three batches and mix after each addition. I don’t use the electric beater to mix cake flour because, I feel that doing so makes cupcakes sink. So didn’t want to take chance. So use a spatula/wooden spoon to mix the flour until well incorporated. Spread the batter in the prepared pan and tap it well on the counter to avoid air bubbles. Bake until golden brown or until a toothpick inserted in the center of the cakes come out clean for 35-40 minutes. Mine was done in 33 minutes itself. You will notice that the cakes starts pulling out from the sides of the pan. Cool the pan on a wire rack for about 10 minutes. If you use parchment paper to line the pan, 10 minutes should be fine to get the cake out of the pan. If not, then you might have to wait for another 10-15 minutes. Beat the butter until it’s light and creamy. Then beat in the cocoa powder, confectioner’s sugar, vanilla extract and milk until it’s nice and smooth and proceed to frost as usual. I’m making your eggless yellow cake but I self raising flour. So does the measurements for all differ? Hi, I made this as a cupcake and it came out fantastic! 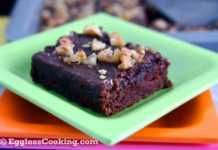 Hello madhuram..Many thanks for this recipe. I made two tired yellow cake with sprinklers n covered with fondant with cream cheese frosting. Loved by everyone.thanks for the use of tofu in a wonderful way. After using tofu once, I always try to use tofu in all my cakes.wanted to post the photo of cake but I didn’t find any option to do that. You’re very welcome Ankita. Thanks for the feedback. Will do something about uploading photos. Hi! I made this cake for my husband’s birthday yesterday and it is a gorgeous, delicious and melt-in -your-mouth cake. Your recipes are great! Thank you so much for all the recipes the you post. Oh wow! 3 cakes! Thank you so much Anshu. Your feedback is much appreciated. When you say 2 cups cake flour, what flour are you referring to? All purpose flour plus 2 tbspoons of the flour + 2 tbspoons corn starch, which flour are you referring to? I bought cake flour from store without and didn’t have to make these substitutions. So it’s what it says, just 2 cups of cake flour. Shall I use paneer instead of tofu. When I refrigerate the cake after decorating my sponge gets hardened y? Will you pls. help me out in these issues. Hey! I wanted to let you know that a 13.6 oz can of coconut milk or coconut cream is a perfect sub for the silken tofu. What you do is buy a can or two and make certain that you don’t shake the can or anything and take just the solid cream part out (not the liquid part) and use a 1/2 cup of that instead. If you want to be sure it’s solid you can put it in the fridge for an hour or so. You will not be disappointed. Also it never hurts to add 1-1.5 tsp of vinegar to any eggless recipe. where do u get silken tofu. Where are you put up Mamatha? In US and Canada it is available in almost all grocery stores. I think it does Kristy. Saw a few comments here about freezing the cake. I am thinking of baking strawberry cake.Can the strawberry substitute tofu?i am thinking of adding milk instead of buttermilk ,can i use lime juice instead of vinegar ? I wouldn’t suggest substituting strawberry for the tofu. Yes you can lime juice instead of vinegar though. I made this cake last week for my Kid’s Birthday. Had followed the instructions correctly but i felt the cake was too dense. It ddint come out soft and fluffly. Don’t know what went wrong since the instructions are pretty simple to follow. Your Strawberry cake base is good provided we bake on a 8 inch pan. Hmm..if I remember right it was not that dense. Actually everybody loved this one. So not sure what went wrong. In your other recipes you mention yogurt and silken tofu in 1:1 ratio provide best results. So why only silken tofu in this .. Any particular reason ? The original recipe recipe used some buttermilk (usually some yellow cake recipes use it). I added some more in place of the yogurt. That’s why yogurt is not used too. I request help on this at your earliest. Baking on Saturday for a post-Diwali party and it needs to be eggless. I already have a Vanilla Box Mix from Dr. Oetker. It needs 3 eggs + 1/2 cup oil + 2/3 cup milk. Can you help me convert this into an eggless version. I have silken tofu at home. How should I substitute for the 3 eggs using silken tofu ????? 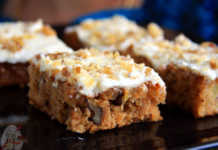 Have you baked from a box mix b4 eggless? How was your experience ?? I have baked eggless from cake mix. Used yogurt instead of the eggs, in this recipe: https://www.egglesscooking.com/2009/11/16/eggless-vanilla-cake-using-cake-mix/ I had used 3/4th cup of yogurt for 3 eggs, 1/4th of a cup for each egg. This was before I knew the tofu-yogurt combination. Maybe you can try 1/2 cup of yogurt, 1/2 cup of silken tofu, 1/2 cup oil and 1/2 cup of milk instead. how many cupcakes could me make out of this batter ? I’m thinking 8-12 maybe. Don’t exactly remember the batter consistency. Looks great but was it just the butter that makes it yellow? Would like to know! Enjoy your recipes and instructions! Thanks Vona. I guess the butter and eggs also make it yellow in the original recipe. But in this case it’s just the butter. 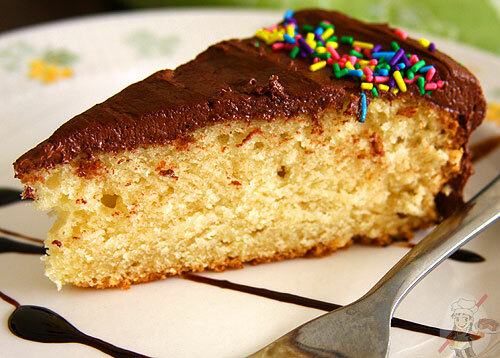 Can I add some chocolate chips or Tutti Fruitti (omit the frosting) and make this like a sponge / coffee cake ?? Will the batter be able to hold the chips ? Yes you can add and it should be fine. Gorgeous yellow cake, wish i get a slice of..